Karate history can be traced back some 1400 years, to Daruma, founder of Zen Buddhism in Western India. Daruma is said to have introduced Buddhism into China, incorporating spiritual and physical teaching methods that were so demanding that many of his disciples would drop in exhaustion. 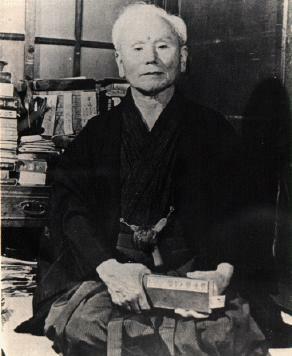 In order to give them greater strength and endurance, he developed a more progressive training system, which he recorded in a book, Ekkin-Kyo, which can be considered the first book on karate of all time. The physical training, heavily imbued with Daruma’s philosophical principles, was taught in the Shaolin Temple in the year 500 A.D. Shaolin (Shorin) kung-fu, from northern China, was characterized by very colorful, rapid, and dynamic movements; the Shokei school of southern China was known for more powerful and sober techniques. These two kinds of styles found their way to Okinawa, and had their influence on Okinawa’s own original fighting method, called Okinawa-te (Okinawan hand) or simply te. A ban on weapons in Okinawa for two long periods in its history is also partly responsible for the high degree of development of unarmed fighting techniques on the island. In summary, karate in Okinawa developed from the synthesis of two fighting techniques. The first one, used by the inhabitants of Okinawa, was very simple but terribly effective and, above all, very close to reality since it was used throughout many centuries in real combat. The second one, much more elaborate and impregnated with philosophical teachings, was a product of the ancient culture of China. These two origins explain the double character of Karate–extremely violent and efficient but at the same time a strict and austere discipline and philosophy with a nonviolent emphasis. Tsutomu Ohshima was one of Master Funakoshi’s last direct pupils (1948-1953), studying under him while attending Waseda University in Tokyo, Japan. In 1955 Mr. Ohshima came to the United States and was the first person to teach karate to the US public. By 1959 the Southern California Karate Association (SCKA) was formed, which has grown over the years to become a nationwide organization, Shotokan Karate of America, and Mr. Ohshima’s influence on karate is felt around the world. Despite the secluded nature of Mr. Ohshima’s early US practices, knowledge of his teachings quickly spread and membership steadily increased. In August of 1957 Mr. Ohshima was asked to demonstrate Karate during the intermission of the annual Nisei Week Judo Tournament, held in Koyasan Hall in Little Tokyo, Los Angeles. This was the first public demonstration of traditional Shotokan karate in the United States, and has since become an annual SKA activity. In 1958 a separate karate tournament was added as part of Nisei Week under the direction of Mr. Ohshima. The Nisei Week tournament is now the oldest annually held karate tournament in the United States, and is still presided over by Mr. Ohshima. In 1960, three years after the death of Master Funakoshi in Japan, Mr. Ohshima led the Waseda Karate Club black belts on a tour of Okinawa and its karate experts. This was the first official visit by students from the Japanese mainland since before the Second World War. A key event in the history of US karate occurred in 1967 when Mr. Ohshima brought the first organized group of karateka (karate practitioners) from America to tour and demonstrate in Japan. During their two weeks in Japan, this group of 36 black, brown, and white belts (including two from Canada and two from Europe) left a strong impression of the high degree of development that karate had attained in the United States. This visit created much interest in American karate among Mr. Ohshima’s seniors in Japan. In 1968 Mr. Ohshima invited Senior Isao Obata, the first Captain of the Keio University Karate Club, to the United States. During his stay Senior Obata personally observed and educated Mr. Ohshima’s students. In 1970 five SKA members (John Beltram, Don DePree, Jeff Klein, Ron Thom, and Henry Wilkerson) were honored by being selected to the United States team representing America in the first World Karate-do Championships held in Tokyo, Japan. Their outstanding performance enhanced the international reputation of Shotokan Karate of America. Another visit of major importance from Japan occurred in 1973, when Mr. Ohshima and SKA invited Senior Shigeru Egami to the United States. SKA organized a massive demonstration for Senior Egami, and he honored us by lecturing and educating our members. During 1975, because of SKA’s committed involvement with the Amateur Athletic Union, the entire responsibility for the Third World Karate-do Championships was thrust upon us. Participants from 35 countries traveled to Long Beach, California, for the event. It was an enormous and difficult task, but it ultimately enhanced our goal of spreading the ‘way’ of karate by increasing communication, heightening understanding of karate, and gaining constructive viable relationships with martial artists and leaders from all parts of the globe. In 1975 SKA invited Senior Tadao Okuyama to visit the United States to observe our members. 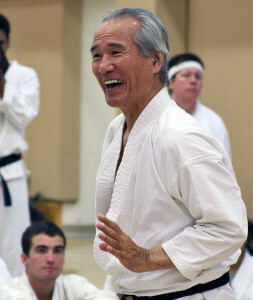 He also personally led Mr. Ohshima in daily practices. To commemorate our 20th anniversary in 1976 SKA held a memorable celebration, including a public demonstration and tournament. High-ranking karate experts from all over the world came to honor the occasion. Various speeches and awards were made, including a presentation to Mr. Ohshima of a special plaque by Councilman Bob Farrell on behalf of the City of Los Angeles for his unselfish devotion to karate, his students, and the public for over twenty years. We were especially honored by the presence of Senior Kamata-Watanabe from Japan, who accepted our invitation to attend. Senior Kamata-Watanabe spoke to our members, emphasizing that all members of SKA should be proud of our association with Mr. Ohshima for his work over the last twenty years in developing the strongest and most traditional karate organization following the teachings of Master Funakoshi. The highlight of the 20th anniversary took place at the special dan (black belt rank) promotion personally administered by Senior Kamata-Watanabe with Mr. Ohshima at the Melrose Dojo in Los Angeles. In the tense atmosphere of the dojo crowded with SKA black belt observers, three men (Caylor Adkins, Sadaharu Honda, and Daniel Chemla) became the first individuals outside of Japan to be awarded the rank of godan (fifth degree black belt), the highest that can be achieved. This event marked the coming of age of Shotokan Karate of America!